Part 2 of a 2-Part Series on the Topic of Angels. 2. When Peter pulled his sword to “protect” Jesus in the Garden of Gethsemane, Jesus rebuked Peter by asking, “Do you not think I cannot call on My Father, and He will at once put at My disposal more than twelve legions of angels?” A single Roman legion numbered 6000. Twelve legions would total in excess of 72,000 angels. That’s scary when you consider a single angel slew 185,000 Assyrian soldiers in 2 Kings 19:35. 3. Extremely powerful [as an extension of God’s power.] C.S. Lewis – “In Scripture the visitation of an angel is always alarming; it has to begin by saying ‘Fear not.’ The Victorian angel looks as if it were saying, “There, there.” In Matthew 28:2-4, a single angel rolled back the stone from the tomb. In Revelation 20:1-3, a single angel will throw Satan into the Abyss. Some believe that Jesus’ words in Matthew 18:10 suggest we each have our own guardian angel. 4th Century Bishop, St. 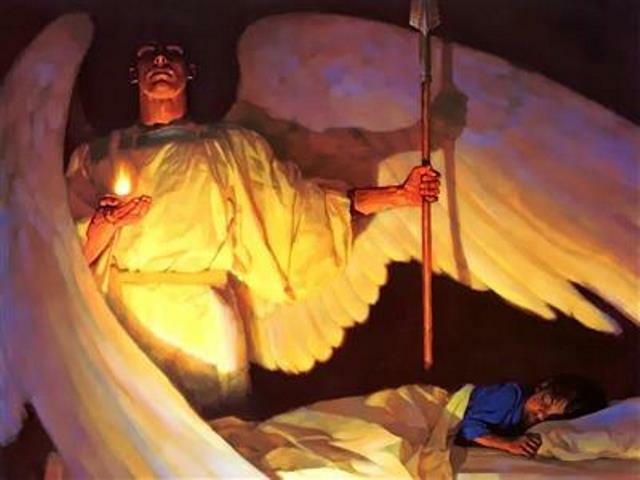 Basil the Great said, “Beside each believer stands an angel as protector and shepherd leading him to life.” John Calvin wrote, “Whether or not each believer has a single angel assigned to him for his defense, I dare not positively affirm.” Some say yes. Most scholars agree that Scripture is inconclusive on the topic. Do people have “angelic encounters” today? 3. I, myself, believe with all of my heart I had an encounter with an angel in December of 1983. I was about 20 years old, living in Abilene, TX, and attending HSU. One very late night, when my father was extremely drunk and full of rage, I found myself in a most dangerous situation. It was during this moment that I had an experience I, to this day, cannot explain. It involved a “stranger” who appeared, cared for and protected me, then disappeared. I’ll never forget it. Ever. If you missed Part 1 of this series you can access it here.